I just purchased the home at 213 Meadow Road, Pasadena, MD 21122. It was a new build so there was no Recycling Bin provided to this household before. We tried to obtain one from one of the offices (near the Millersville landfill) this past Saturday but were referred to the aacounty website to request a recycling container online. The pole on the corner of garden and Carroll has wire that has come unwound and is laying all over the ground. The wind keeps blowing it into the street. I already contacted bge and they are not their wires. 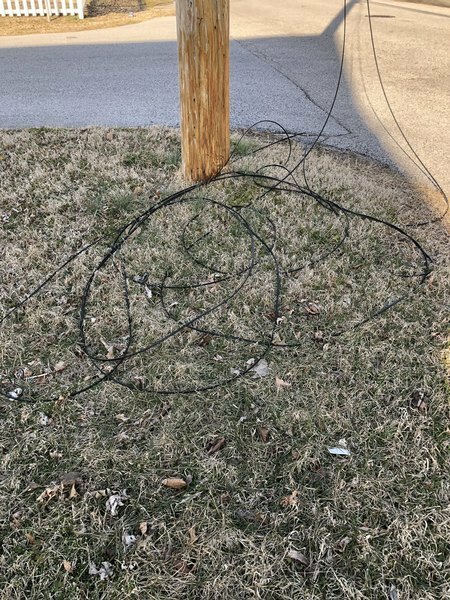 I’m not sure where else to turn because bge says could be cable or phone. I placed incident # 5491707 on 3/6/2019 the issue was looked at and closed and is now archived. None of the potholes have been filled. I am not sure what we have to do to get this road repaired. I have been told that we are on the list to have the road re done in 2 years. The people in the this community are going to start sending their repair bills for their cars to the County. Please fix these potholes!!!! DPW Highways will patch the holes today. Truck load of mulch in road way. Sign say free mulch. The mulch has been there for over a week and is causing a hazard to drivers and pedestrians. You can't see over the pile and it's blocking a lane. You must go around the mulch onto oncoming traffic to avoid hitting it. The mulch is not treated or dyed therefore it looks more like a chipped up tree and no one has taken it. Again it has been there for over a week and the homeowner is not taking care of removing. Work order #18357658 has been created and assigned to the Northern District Road Operations for investigation. After the initial investigation, a representative from the Road District will be in contact with you at the number you provided. If you need additional information, please contact Northern District Roads at 410-222-6120 and reference WO# above. This non-emergency app is screened for incoming requests during normal business hours only, Monday through Friday, excluding holidays. Emergencies should be reported by telephone to your local Road District. For after hours or weekend emergencies, please call 410-222-6120. There are two issues in regards to storm water drainage. The first is the inlet next to and to the left of 225 Matfield Ct not taking storm water maybe clogged or blocked but takes sometime for water to drain into. The second issue is the erosion/sink hole located near the storm drain in the grass circle in front of 225 Matfield Ct. The stormwater runoff has caused a sink hole to form. I would like for both of these issues to be looked at and to get back to me with what action will be taken to correct the issues. This issue was recategorized from Water/Wastewater Concern to Drainage Maintenance. Work order #18361163 has been created and assigned to the Northern District Road Operations for investigation. We are currently backlogged with drainage issues. Please allow 7 days for initial investigation. After the initial investigation, a representative from the Road District will be in contact with you at the number you provided. If you need additional information, please contact Northern District Roads at 410-222-6120 and reference WO# above. This non-emergency app is screened for incoming requests during normal business hours only, Monday through Friday, excluding holidays. Emergencies should be reported by telephone to your local Road District. For after hours or weekend emergencies, please call 410-222-6120.